When I came to Step Two I realized that although I was a committed Christian and I really believed in God, my problem was that in some very important respects I was living a frantic, highly stressed existence as a Christian professional speaker and writer. I knew that something was not right: I was teaching about grace and freedom, on the one hand, and my life was anxious, stressful and over committed, on the other. But I was in denial and couldn’t see how bizarre the contradiction was. People in this program have helped me to realize that anything I do or think that is destructive to me or to my relationships with other people or with God is a kind of insanity, especially when I keep doing it month after month. Few indeed are the practicing alcoholics who have any idea how irrational they are, or seeing their irrationality, can bear to face it. Some will be willing to term themselves “problem drinkers,” but cannot endure the suggestion that they are in fact mentally ill. They are abetted in this blindness by a world which does not understand the difference between sane drinking and alcoholism. “Sanity” is defined as “soundness of mind.” Yet no alcoholic, soberly analyzing his destructive behavior, whether the destruction of the dining-room furniture or his own moral fiber, can claim “soundness of mind” for himself. Some things are easy to believe. It is easy for most of us to believe that God will punish us. It is easy for us to believe that God will be displeased with us or that God dislikes us. What is difficult for many of us to believe is that God is more powerful than we are and that God is ready and able to use his power to help us. For a variety of reasons, many of us have distorted beliefs about God. We may fear that God is not very powerful–that God is weak or passive or disinterested in our lives. Or we may believe that God is powerful, but we fear that God will use his power to hurt us or to punish us. These distortions make it difficult for us to accept God’s power–or God’s willingness–to restore us to sanity. In Step Two we start the process of learning that God’s power is for us, not against us. To believe means to put faith and trust in something or someone. In Step One we started to face the truth about our lives. In Step Two we come to believe in something or someone greater than ourselves. It is important to remember that God honors and responds to the smallest step of faith–even if it is mixed with uncertainty and disbelief. It is not necessary in Step Two to have absolute certainty and total confidence. Jesus said that faith as small as a mustard seed can move mountains (Matthew 17:20)! 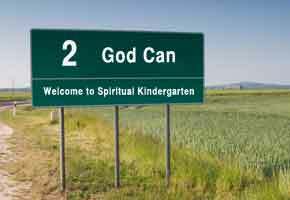 We may not have a lot of faith or trust when we enter spiritual kindergarten, but God can do a lot with what we have. Jesus emphasized this truth when he responded with compassion to a person who came to him for help saying, “I do believe; help me overcome my unbelief!” (Mark 9:24). Step Two introduces a foundational spiritual truth: There is a God, and it is not me! In Step One we saw the results of our efforts to manage our lives on our own power. Now we can begin to look outside ourselves for the help we need. Remember Jesus’ story about the prodigal son? (See Luke 15:11-32.) The prodigal son came to believe that he needed a Power greater than his own, so he decided to return home to his father. He expected his father to disown him and treat him like a slave. He did not know much about his father; he certainly did not understand his father’s love and compassion. But the son did have enough faith to begin the journey home. Faith like that of the prodigal son is all we need in Step Two. At this stage of the journey we don’t need sophisticated theology or years of Bible training. All we need is enough faith to get us headed toward a Power greater than ourselves. Later in the journey, we will learn much more about the Power who is helping us to make this change. Notice that Step Two invites us to believe that restoration could happen. Step Two does not require us to believe that we will be restored. We may not yet be able to imagine that. We only need to believe that it could happen–if a Power greater than our own is available. That is why Step Two is sometimes called the “hope” Step. It introduces the possibility of restoration to sanity through a Power greater than ourselves. In Twelve Step programs, insanity is often defined as “doing the same thing over and over, while expecting a different result.” For example, some of us use mood-altering substances (alcohol, drugs, nicotine, prescription medications, and so on) or controlling behaviors (manipulation, threats, avoidance, and so on) as our standard solution to life’s problems. But the outcome is always predictable: we get more of the same chaos. Insanity in this context can be applied to any of us–even if we are not struggling with an addiction. We all tend to repeat the same kinds of self-defeating behaviors over and over again, expecting different results. The core of Step Two is coming to believe that there is a Power that could help us find a different, saner way to live. Things can improve, we can be healed, and our lives can become more peaceful and rewarding.